Though not the usual play about HIV/AIDS, Theater J’s current offering, “Roz and Ray” by Karen Hartman, tells an important story of both queer history and the history of HIV/AIDS in America. While it’s widely known that hemophiliacs were hit hard at the onset of the crisis, the disturbing details surrounding what happened to those boys and how drug companies were involved isn’t common knowledge. Here, the facts are laid bare. Directed by Theater J out artistic director Adam Immerwahr, the San Diego-set two hander spans some tough years, 1976-1987, and one difficult day in 1991. Dedicated pediatric hematologist/oncologist Roz (Theater J associate artist Susan Rome) is charged with the complicated care of the hemophilic young twin sons of single father Ray (local favorite Tom Story). 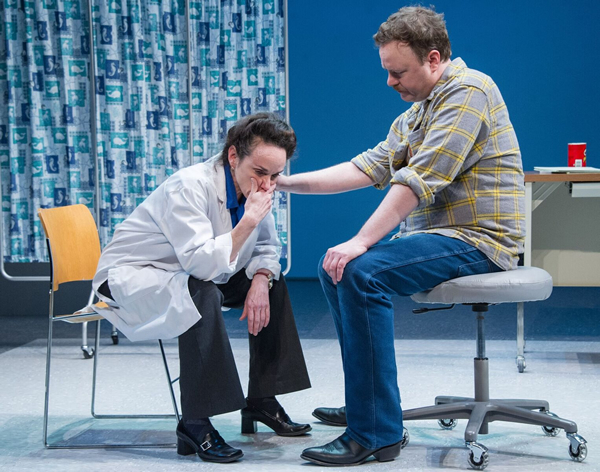 The play focuses on the pair’s unlikely relationship and how Roz reacts when new wonder drug, Factor VIII, is discovered to be giving patients HIV/AIDS at an enormously high rate. Factor VIII was a pooled blood product derived from plasma. And because it was a concentrated blood product, each dose contained blood from up to 20,000 donors, very often drawn from high risk populations, at a time before heat treatment was used to remove the virus from blood products. The implications were staggering. Immerwahr says it was a tricky time because while a few hemophiliac children in the early ‘80s had died of gay-related immune deficiency (GRID) and eight more exhibited symptoms, Factor VIII was also responsible for keeping children alive and giving them normal lifespans. Conflicting information from the Centers for Disease Control and the National Hemophilia Association flummoxed doctors and parents. Smartly, Hartman doesn’t tell an HIV/AIDS story without including gay men. Ray was married to his sons’ mother and is having episodic relationships with men. Story also says his characters possible bisexuality adds layers for him to work with. Hartman’s play is devastatingly sad. It’s also timely. “We as a society want regulations or some might call them protection in the products we interact with. In a quiet way the play makes a statement on what the role of profit motivated companies is in protection us or failing to protect us,” Immerwahr says.